Okay next up on the blogging docket is the Hey June Halifax Hoodie. I don't know why it took me so long to make this pattern up, because it quickly became a staple in my wardrobe. I made these two back in March, and then proceeded to make a whole army of them and I wore them for the rest of the winter and right through spring. Seriously, jeans and hoodies were my uniform, and it was perfect. Why is dressing in the cooler months so much easier for me? Anyway I know I'll be wearing them like crazy again when the weather cools down. Okay so I have a bunch more of these to share with you, but for now let's talk about the first two that I made. The Halifax Hoodie is an extremely versatile pattern that comes with 5 different views. I honestly, have nothing but good things to say about this pattern. The drafting and the instructions are great, and I had no trouble putting the pdf together. Plus you can print only the pages you need for the view that you are making, which is a feature I LOVE. This was a quick sew for me, and when I finished it, I was absolutely delighted with the result. It was so comfy, and I did not want to take it off. So I knew I had to make another one right away. For my second Halifax Hoddie, I decided to try View A. The more traditional hoodie style. Once again, I went with the size large, but because of the different neckline, this view has different body pattern pieces and I completely forgot to shorten them. So this hoodie is made full length. But that actually worked out well for me and is perfect with leggings for cozying up at home. The sleeve pattern piece is the same though, so they were still shortened by 2.5". I was a little worried about sewing the neckline of this version, but it worked out just fine and the instructions again were fantastic. Sorry my hood is a bit inside out in these photos. I put both of these hoodies together with my serger, and my regular machine. With minimal topstitching required, these sew up super quick, and were a great palette cleanser/instant gratification project for me. Oh and guess I should mention the fabric. Ha ha! Both of these hoodies were made out of a super luscious bamboo french terry from Blackbird Fabrics. It's so soft, and cuddly, yet not super thick, and also quite fluid. It's really lovely to wear. Anyway, thank you so much for your comments on my last post, it's nice to know that people are still reading my blog even after a bit of an unplanned hiatus. I'll be back again soon with some more Halifax Hoodies. Woo! Let's start with some details. I was kind of all over the place for the size range so I decided to make a quick muslin of the bodice. I chose to muslin a size 10 with fabric very similar to my final fabric, and it looked great. So I proceeded to make the size 10 in final fabric. In hindsight, I really wish I would have made the size 12. I think the back looks pretty good, but you can see that it's a little tight across the bust and the belly, and therefore I don't think the wrap is sitting quite how it should. This pattern also has quite small seam allowances for a woven (3/8") , so that doesn't give much wiggle room. This pattern comes with two lengths, a maxi and a midi, and sleeveless or cute little short sleeves. I went for the midi without sleeves, and as you can see, it's much closer to maxi on my short body. This is the first time I've made or worn a wrap dress, and I was a little worried about it gaping and falling open. While the wrap itself is secured on the inside with a button or snap, and stays secure, for me I didn't feel like it was secure enough across the bust. Now this might be less of an issue, had I made a better size for my bod, but I think I would add some type of closure at the bust, like a little snap or something like that. Otherwise I would be constantly adjusting like in the photo below. Alright! Done! I have some posts to write so hopefully I'll be back soon. Hope you're having a great summer so far. Hey Everybody!! I seem to be moving right along in the blog posts. What is this, the third post in less than a week? Wowsers! I must be procrastinating something else in my life. LOL Just kidding! Or am I? Ha ha ha! When I get the urge to blog and I have the photos, I gotta go with it. 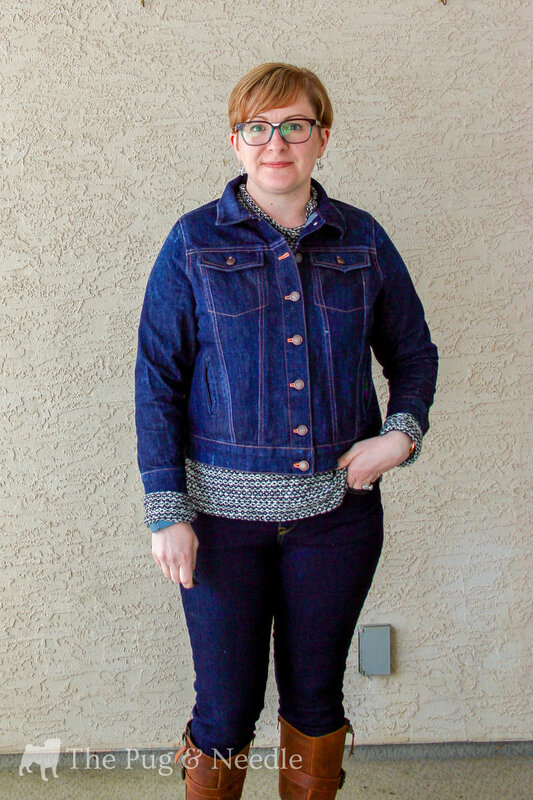 Anyway, I'm back with a truly amazing new pattern from Alina Sewing + Design Co: the Hampton Jean Jacket. I don't know if you guys are like me, but I am addicted to Instagram Stories. I watch them all the time, and when I saw a little flash of a jean jacket on a dress form in one of Alina's stories a while back, I got really excited. I've been a part of her pattern tester group before, so I was crossing my fingers and hoping that she would invite me to test it. I LOVE a good jean jacket and as you probably know by now, I love sewing denim! Anyway, when a message came through a little over a month ago asking me to test this beauty, I jumped on board! And as you can see, I'm pretty happy about it. Ha ha! Just a quick heads up, this is a pretty picture heavy post for only one new garment, but I'm just so pleased with how it turned out and I have been waiting to show it off for what seems like forever! (Really it's only been about 2 or 3 weeks, but still.) Also, I feel a bit like an 80's Jordache model because of all the denim, but I'm cool with it. "A nod to the classic jean jacket, the Hampton Jean Jacket pattern is a timeless addition to your handmade wardrobe. This flattering pattern is cut to be close-fitting, yet roomy enough to wear over a couple of light layers or a thin sweater. With welt pockets, in-panel top pockets, two-piece sleeves, and all of the panels you know a jean jacket to have, this pattern is everything you want in this classic piece." And I couldn't agree more, this is a super classic and timeless piece that I think everybody can use in their wardrobe. One of my favourite ways to wear a jean jacket, is over a dress. Of course it's much too cold for me to style it that way right now, but I am doing it with a old RTW jacket, here and here. See what I mean? Great with dresses for a more casual look. I also love it over a striped tee or a button down, and it's going look great with my Chi-town Chinos too. I was actually a little surprised at how well it worked over this Toaster Sweater. Hooray for layering! I'm really excited that it's now officially spring and starting to warm up so I can wear this bad boy a ton! As usual, with Alina's patterns, the pdf went together really well, and the instructions are top-notch. Alina has great diagrams and descriptions, and while this pattern might look a little intimidating, I assure you, it is fun to sew and incredibly rewarding! If you've sewn a button down shirt, or really any garment with a collar, set -in sleeves and button holes, you can handle this. Plus there is also going to be a sewalong coming in the next few days with all kinds of helpful hints and tricks, so not to worry, Alina has got you covered! And as always, you can email or message me on Instagram if you need help - I'm always happy to talk sewing and help out where I can. I also know that Alina is truly a wealth of information, and she loves helping out too, so don't hesitate to email her. I love being a part of her tester group because she is super hands on, and quick to answer questions and offer fitting advice. I always wind up with a great fitting, professional looking garment, when I make up her patterns, and the people in her group are always fantastic too! But anyway, enough gushing, back to the jacket. So anyway, I have made a size 12. I shortened the body by 2.5", and the sleeves by 3.5". I also did a narrow shoulder adjustment of about 2cm, which I should have taken into account when shortening the sleeves, but I didn't, so my sleeves ended up a little short, but I'm okay with that. I also sanded the crap out of this jacket as I was making it. I used a really heavy 80 grit sandpaper, that I found in our garage, and went to town. I sanded all the seams as I sewed, before I topstitched each one, being careful not to sand any previous topstitching. I did a combination of flat felled seams and faux flat felled seams, as Alina suggests in the instructions. There are a couple of areas where flat felled seams would have just been too bulky. Once the jacket was completed, I washed and dried it (in the dryer) twice, and it softened up really nicely. The denim I used is a 10 oz, non-stretch Cone Mills denim from Threadbare Fabrics. It's the same denim I used for my lastest pair of Morgans, and it's lovely. There are also really great kits for this jacket available from Threadbare Fabrics now too. They feature some really nice hardware in a few dirfferent colours, and some gorgeous White Oak milled Cone denim. It's from Greensboro, North Carolina - made in the USA - how cool is that? Pretty rare for denim nowadays. I was too impatient to wait for my kit, but I have it now and and it's gorgeous! I should also mention that I made a bit of mistake and didn't topstitch around my welt pockets. By the time I realized it, it was too late and I would have had to do a ton of unpicking to add it without sewing my pockets shut. I'm kind of bummed because I think it really makes the pockets pop, but oh well, these things happen. The night before I was about to finish my jacket, I was lying in bed thinking about sewing, as I always do when I can't sleep, and I started worrying about the buttonholes. If you've ever sewn a pair of jeans, the buttonhole is probably your nemesis, unless you hand sew. But I am pleased to say that my buttonholes turned out really well. My machine had no problem with them. I think because the button band is so flat and not very bulky, it just wasn't an issue. Phew! So there it is! I'm super proud of this jacket and how it turned out. It took some time, it wasn't an instant gratification project, but I'm so thrilled with it. (Can you tell?) I know I'll be wearing it a ton! So now that I have this and a couple of other jackets under my belt (see here and here), maybe I can get over my fear of sewing coats. Ha ha! I hope you guys are all doing well and having lots of fun sewing, no matter what it is! Hello Everybody1 I'm back with a post that I should have written weeks ago, but you know what they say, better late than never right? This is the latest pattern from Helen of Helen's Closet: the Blackwood Cardigan. I was lucky enough to be part of Helen's tester group this go around, and I've been wearing this bad boy a ton since I made it back in January. This cardigan is close fitting, with long sleeves to keep you nice an cozy. It comes in two versions, a long (about mid-thigh length) and a short (which hits around your high hip). It's super quick to whip up (especially if you have a serger) and it is sure to be a wardrobe staple. When Helen sent me an email with the design, I just knew I had to have it. This cardigan is exactly what I'm missing in my wardrobe. When Helen first emailed me the design, I just knew I had to have it. This cardigan is exactly what I've been missing in my wardrobe. I know that oversize and boxy, seems to be the trend lately, but when you live in a cooler climate and have to throw a winter coat over whatever you're wearing, close fitting can be more practical. Plus, I'm short and a a bit boxy myself, so I like a bit more shape to my garments. I also find that when it's cold, I want to feel snuggled, and a more close fitting garment does that for me. Based on my measurements, I chose a size L. I decided to make the longer version (view A) first, but I knew it was going to be way too long, so I shortened it by 4 inches. I also shortened the sleeves by 3". I'm super happy with how the length turned out. The sleeves are meant to be on the longer side to help keep your hands warm, but also so you can hold on to them when you put your coat on over it. I think this is genius. I hate when my sleeves get all bunched up inside my jacket. The only trouble I had with sewing this cardigan was sewing those pockets on without them going all wonky. I must have unpicked that first one 3 times!! Then someone in the test group mentioned stabilizing the pocket with wonder tape or steam-a-seam, and it worked perfectly. Why didn't I think of that?? (You can also use tissue paper, and Helen has now included how to do that in the instructions). Anyway, I still had to sew carefully, but I know if I had done that in the first place I would have avoided A LOT of unpicking. Other than that, this cardigan sewed up super quickly, and is definitely an instant gratification project. I love those, especially in between more intense projects. I should also mention that the pdf went together super quick, and the instructions are awesome. Helen's graphics are fantastic, and she also has lots of great little tips included too. The fabric I used for this version, is an amazing sweater knit from Blackbird Fabrics. It's a rayon-cotton-modal blend, and it's so soft and so cozy! It's a medium weight, but it really feels like a sweater. Sometimes you get sweater knits and they're thin, but this stuff is really nice. And guess what, it's just been restocked. How's that for timing? I don't think this colour (Ivy) is available any longer, but there is still black, mellow mauve (I love that name), dusk (which is like a dark navy) and steel grey. Anyway, it feels good to have this post written, phew! I don't know what it is, but I've just not been into blogging lately. I'm definitely still into sewing, but blogging always seems to be waaaaay back on the very back burner. LOL. And I've been really awful with reading other people's blogs too. Ugh! Anyway, I have also made the shorter version of this cardigan but I haven't properly photographed that one yet. Hopefully I'll get around to that soon. I hope you guys are staying warm! Hey Everybody!! How are you all? I'm doing pretty well, but I'm cold!! This winter is going on forever! When will it warm up?!?! Anyway, I thought I'd do another quick and dirty post to show you my latest Archers. The Archer pattern is definitely a TNT for me, and I wear them all the time!! Sewing a button down shirt is so satisfying and even more so, when it fits!! I'll post the details at the bottom, and again if you have questions for me, or if I left anything out, don't hesitate to ask. The Eiffel Tower fabric is from Sew Over It (and they still have it). I think it's actually more of a quilting/craft cotton but it worked perfectly for this shirt. This one is made from scraps of the Liberty one, with some gorgeous tencel denim from Blackbird Fabrics. I think it's sold out now, but they do have some nice chambray instock. Or if you have your heart set on tencel denim I think Stylemaker Fabrics has some similar here and here, and Threadbare Fabrics has this gorgeous one in stock too (it's lighter in colour and weight than what I used but still beautiful and perfect for summer). Told you it would be quick! I hope you're all doing well! PS: I just realized I have different glasses on in each group of photos. I took the photos on different days, anyway, my glasses are all internet cheapies from Firmoo.com if you're interested. I like having a bit of a glasses selection, and also being able to try some trends without having to commit. ;) I've said this before haven't I? I'm getting old guys, I'm getting old. Ha ha ha! Fabric: this is a dreamy, double brushed poly knit from LA Finch Fabrics (I think there are sold out of blue but they do have black and green). It feels amazing but is probably a bit too thin and fluid for the neckline of this pattern. Still, I love it! I chose a size M based on the finished measurements. I made no changes and as you can see the sleeves are long, but the top itself is quite short. If I lift my arms up, you can see my belly at the sides. Next time, I will lengthen it. There we go, a quick and dirty post. If I've forgotten to tell you anything or you have more questions, please don't hesitate to ask! I hope your February is going well so far!